HOW IS MODULAR FURNITURE DRIVING TODAY’S COMMERCIAL BOOM? New and/or alternative options for commercial space design and fit out are being considered. Both trends emphasise a greater focus on delivering new solutions that meet the evolving needs of end-users. To this end, furniture specification has entered new realms of demand and expectation, particularly with regard to the breadth of possibilities that modular systems can bring to the end client’s balance sheet and corporate responsibility agenda. agile behaviours and adapt alongside the potentially disruptive changes to business culture over time. In this whitepaper, we explore how modular furniture addresses the concerns of the modern workplace, the changing nature of the workforce. Modular furniture solutions can be instrumental in providing a flexible, healthy and productive workspace for many types of uses and users. Modular furniture has been a staple in office fit outs even before the popularity of open plan spatial design in commercial spaces in the mid-eighties. In the most simplistic of terms, modular furniture can be described as furniture that can be easily disassembled or reconfigured based on usage or spatial requirements. In the context of asset management, modular furniture comprises the individual components required to create a workstation. This characterisation of furniture as ‘modular’ is important as it can determine whether or not such assets are ‘minor’ or ‘major’ inventory, can be insured and/or can be capitalised. The emphasis in this definition is the ease in which modular furniture components can be put together, but also taken apart and put back together to create workstations with different specifications across the total stocked inventory or the combined assets balance sheet. In the context of contemporary office design, ‘modularity’ does not refer merely to a type of furniture, but rather encompasses a broader range of concerns, solutions and approaches that support flexible, agile work styles. This is due to a cultural change from a singular focus on productivity, to a more holistic approach to employee well-being and development. This broader definition is also shaped by challenges posed by the growing ‘gig economy’. A temporary, independent workforce means employees have more freedom to choose where and how they work best, but it also means companies need to maximise limited floorspace, reduce costs and be able to scale work spaces quickly while also providing a work environment satisfying and attractive to existing and prospective employees in line with the skirmishes being waged by the war on talent. Accordingly, modular solutions in the contemporary office includes the prototypical workstations and tables, as well as reconfigurable ottoman systems, wall panels, benches, monitor arms and storage solutions, that can support a multitude of work methodologies on demand. Employee health and well-being is a key concern for the most powerful generational demographic in today’s workforce: the millennial worker. According to a 2017 report by the Huffington Post, the millennial workforce is significantly more concerned with health and well-being than any of their predecessors. For companies that have already recognised the pro-agile nature of this demographic – with the role of technology and digital communications systems heavily integrated into daily work behaviours – this means that facilitating agile work spaces to provide positive health outcomes can mitigate the cost impacts of ill-health. Further, it also draws attention to the crucial role played by sensitive furniture specification in in terms of this sector’s critical success factors: competitive attraction and retention of skilled employees through provision of key workplace amenities. comfort. Customisable workstations, including components such as height-adjustable desks, can be tailored to suit a user’s physical characteristics and tendencies. These options represent a move from a ‘one size fits all’ fixed desk approach, towards workspaces that are reactive to a user’s needs and tendencies. work at a desk while standing up thus reducing sedentary behaviour which has been linked to increased risk of musculoskeletal disease (MSD), respiratory problems, sacral and lumbar ailments. create open-ended environments that can meet the needs of end-users on an on-demand basis, contributing to their overall happiness and well-being. In line with the more human-centric values of today’s leading specifiers in the commercial space, the link between health and productivity is becoming increasingly well documented. A study by Medibank Private found that healthy employees are effective for almost 150 hours a month, whereas their unhealthy counterparts are effective for only 49 hours. Other studies have concluded that employees lose 2.4% of their productivity per health risk factor.8 Illness-related absenteeism costs the Australian economy an estimated $32 billion a year, while staggering positive valuations have been attributed to presenteeism as a result of employees’ greater access opportunity to healthier working beahviours. solutions give end-users the ability to tailor their workspace to suit their individual needs and preferences and create spaces conducive to group work and collaboration. Modular furniture solutions can positively impact productivity levels by facilitating a range of different work methodologies, suiting individually productive working styles. 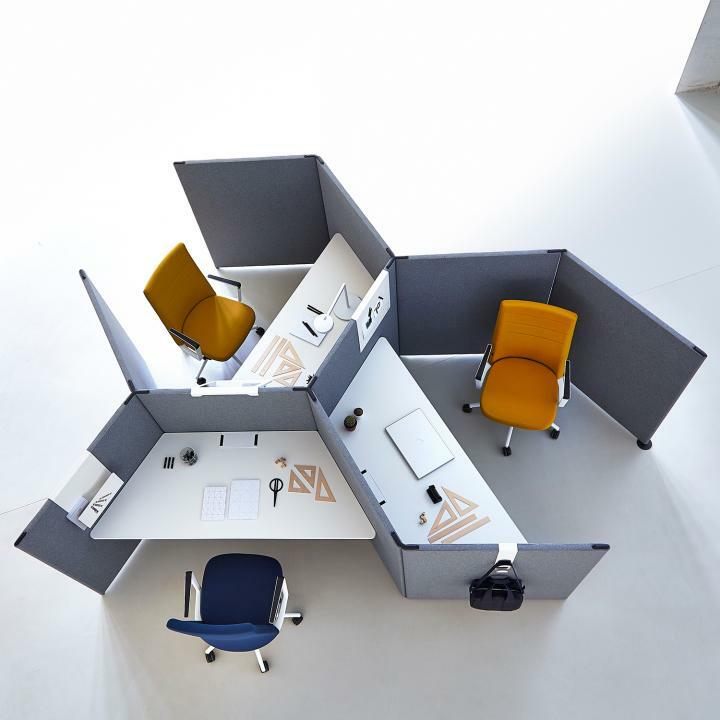 Modular solutions allow companies to strike a balance between open and closed spaces, accommodating employees who value movement and conversation as well as those who require minimal interruption – empowering a broad range of functionalities along the individual-focus to communal-collaboration task spectrum. For example, reconfigurable privacy screens or vertical ideation screens (ie., whiteboards and pinboards etc.) 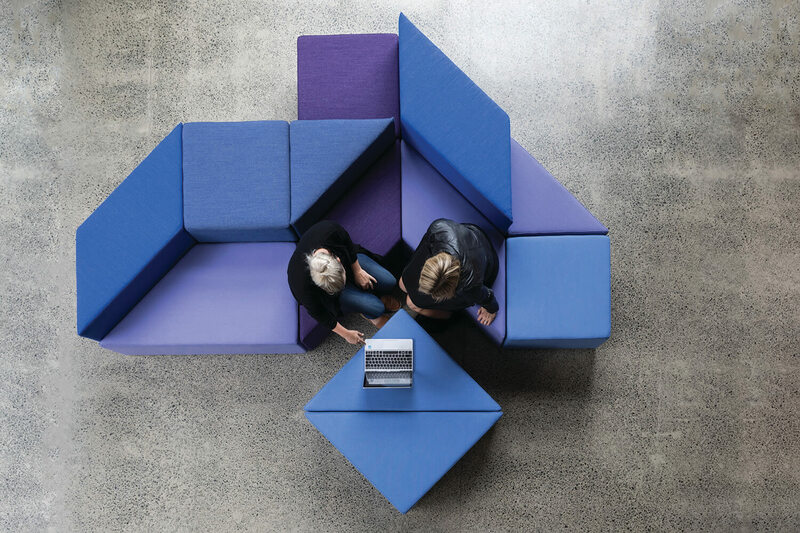 with sound absorbing properties can create spaces for individual work requiring intense focus and concentration alongside areas reserved for group discussion. Modular solutions can also facilitate work styles that foster spontaneity, innovation and collaboration. For example, in a now-famous example at Facebook headquarters, teams can create whatever furniture layout best suits their project whether that be a circular break-out space or long rows of desks. 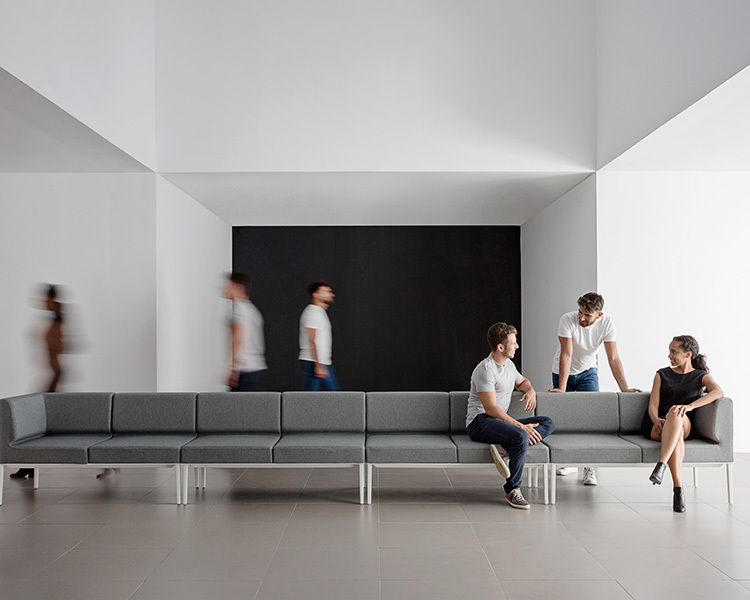 A number of reconfigurable soft seating and table systems offer similar functionality, allowing seating to be arranged in irregular or traditional patterns on the fly depending on a group’s and a project’s collaborative needs. 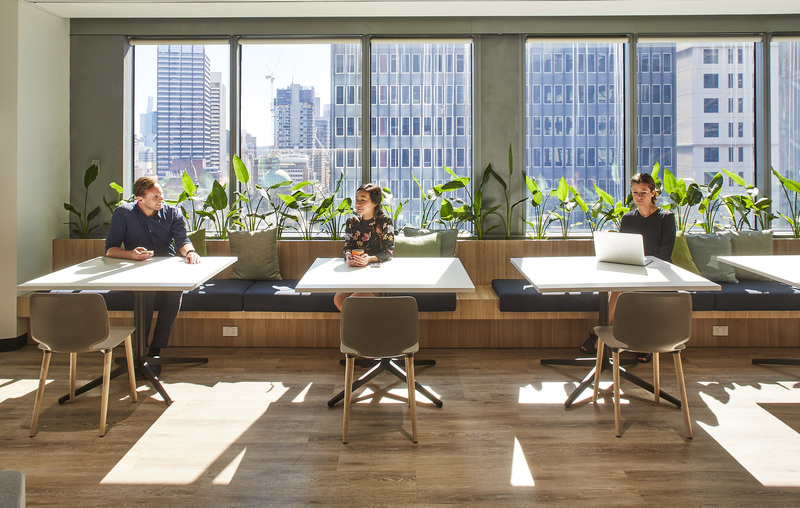 ‘Modularity’ in the contemporary office is also defined by agile workspaces that reflect the flexibility and convenience valued by the modern workforce. As commercial lease periods continue to contract, and as the use of remote contractors continues to rise, the spatial landscape of a commercial environment is on average smaller per square-metre than ever ever before. With this being the case, modular furniture solutions are increasingly allowing companies to accommodate constantly evolving teams and organisation charts, while at the same time ensuring employees have a functional and comfortable work environment irrespective of the capacity of a floorplate. Unlike traditional office furniture that needs to be accumulated or discarded when a company grows or shrinks, modular solutions are easily movable and can be put back together in new configurations to support the reality of fluctuating head counts under the ‘gig economy’. Modular workstations can be expanded when new employees are added, and removed when teams downsize. Even if limited space is available, folding tables can be utilised for hot-desking and group activities, then stored away conveniently to once again free up square-metreage utilisation rate postneed. Storage capacity can be easily increased using mobile pedestals and caddies, which can also double as flexible desks or seating if desk space is to support impromptu meetings and gatherings. This reduces the pressure for growing companies to seek out larger office spaces in today’s volatile property commercial property market, making better use of compact work environments, and passing on crucial value opportunities to clients’ bottom lines. As is unfortunately not often the case, in the contemporary office, ‘modularity’ therefore needs to encompass flexibility and convenience, not just in terms of ease of use, but in relation to meeting the changing demands of the economy and workforce. Using modular furniture, full-time employees can enjoy the benefits of allocated workspaces when needed, while contractors or freelancers can be provided temporary workpoint solutions with minimal disruption. Variable seating styles and table solutions can support agile work spaces and can be changed on the fly to suit business needs. Modular furniture is also less costly, reducing the need for expensive furniture or office remodelling. Companies are thus also empowered with better responsiveness opportunities to integrate new technology into their core furniture assets: installing add-ons or components to existing modular spaces over time without the burden of expensive upgrades of the total unit. In this context, ‘convenience’ is not just concerned with the present, but also with future-proofing workspaces (both physically and economically) in times of constant growth and change. Business Interiors is leading the Australian market in creating dynamic commercial spaces with intelligent furniture solutions. Working across a wide range of industry segments, the company’s approach is sharply focused on the way a space will be occupied and the desired experience intended. The result are spaces that create meaningful experiences for their inhabitants, at the same time increasing productivity and efficiency. Business Interiors is also bolstered by a strong focus on responsible manufacturing. Rigorous design principles and strict adherence to quality and sustainability standards, ensure that their products are of the highest quality while also having minimal impact on the environment. 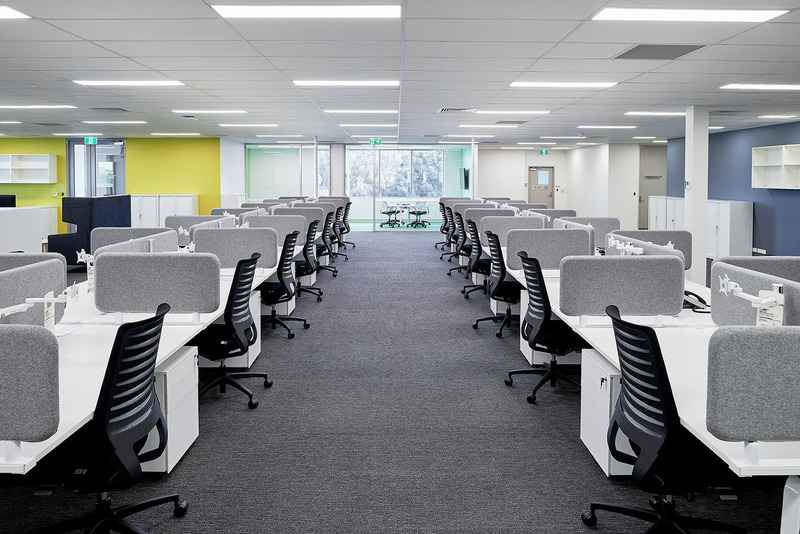 With a dedicated, customer-centric approach that delivers projects on time and within budget, Business Interiors is one of premier providers of modular furniture solutions in Australia. 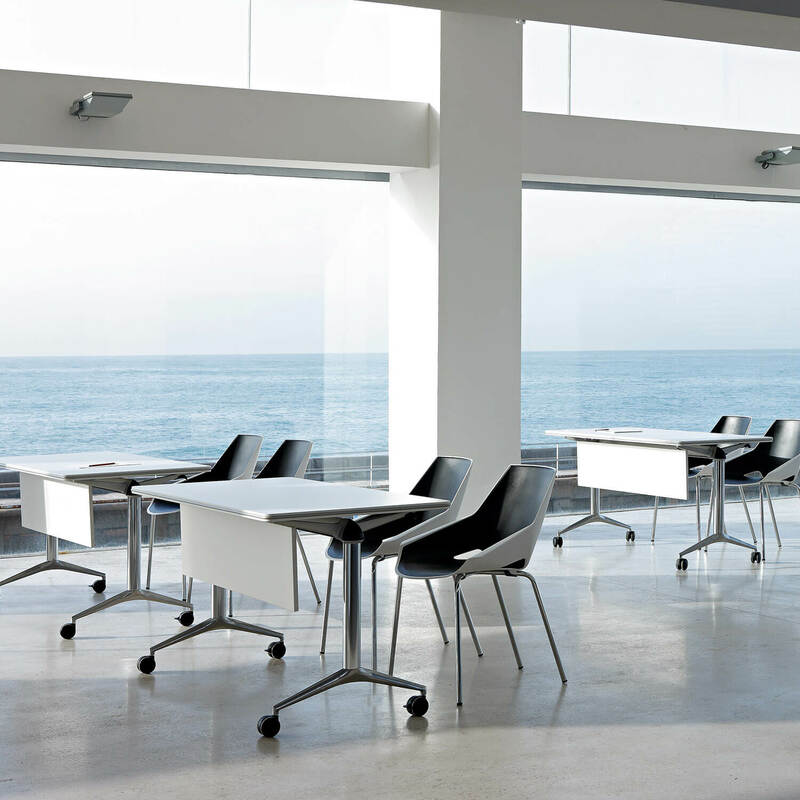 Business Interiors’ range of products deliver on a holistic, contemporary vision of ‘modularity’. The goal is to create compelling workplace experiences with design, fit out and architecture that are responsive to evolving business needs. In other words, modular solutions that provide a flexible framework of options that can meet business objectives at any given time. Implicit in this new definition of modularity, is the understanding that the needs of businesses and employees change over time, often in unpredictable ways. Moment is a modular workstation and table system that can adapt to changing workplaces. It includes screens, accessories and storage options that are interchangeable or removable to achieve a variety of workplace experiences. screens in different configurations to create spaces for privacy, collaboration or solitude. Concealed cable and data management systems allow seamless integration of technology, while also facilitating ease of access with its above-table design. Max is a modular sit-to-stand workstation which can be easily transitioned from a comfortable seated height to an active standing workstation in lightning speed. 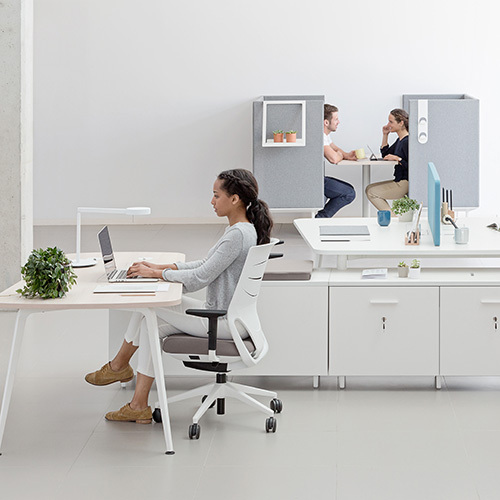 Max offers the perfect solution for acoustics, connectivity, and cable management, and is available in four different options: T-leg frame, panel range, cabinet range with integrated storage, and finally a screen range for complete privacy. Longo is a modular system of soft bench seating, workstations and managerial desks that connect to an aluminium frame. These elements can be configured to connect different modules within a single space. The focus of this system is to inspire an open, relaxed environment where formal work spaces exist seamlessly alongside less structured, dynamic areas. Storage options, sound absorbing panels and decorative accessories can be used to create environments where employees can focus but also relax and collaborate, promoting well-being and productivity. Twist Video Conference tables come in four configurations, and are designed to facilitate face to face and virtual collaboration. Twist is made with lightweight frames that can be easily and quickly rearranged to support different behaviours and activities, including standing and sitting postures. Similarly, Twist Spine workstations can support a variety of configurations and arrangements. Linear desk patterns offer more accessories, power and data integration and storage, while the Organic version features plug and play desks that reflect the agile nature of today’s workforce. workspaces appropriate for the contemporary office. Featuring a screen system that comes multiple height and assembly options, Link can be applied in almost any space to achieve an effortless transition between private desk space and open, collaborative spaces. 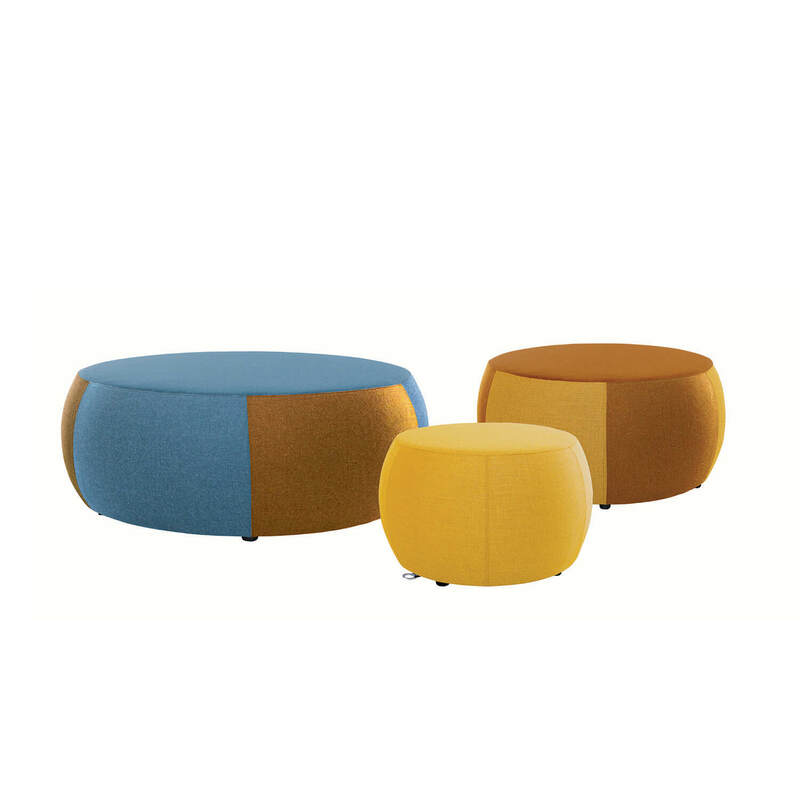 Halo Ottomans is a flexible ottoman seating system that is designed for movement and collaboration. 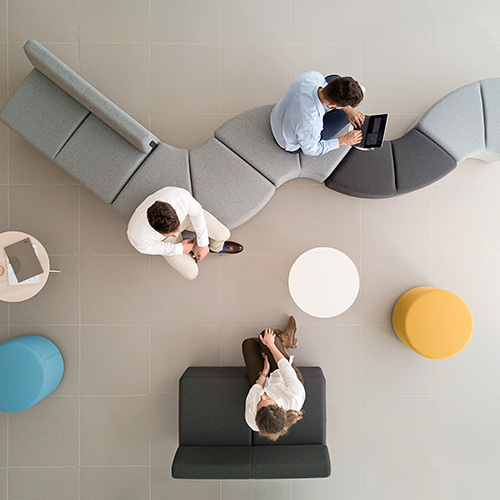 Halo Ottomans come in three different sizes and can arranged across office spaces to create dynamic, communal spaces for group discussion and activity. EightBy4 Ottomans is a reconfigurable ottoman seating system comprised of individual pieces in a variety of shapes and sizes. Individual pieces come in square, trapezoid, triangle and parallelogram shapes. 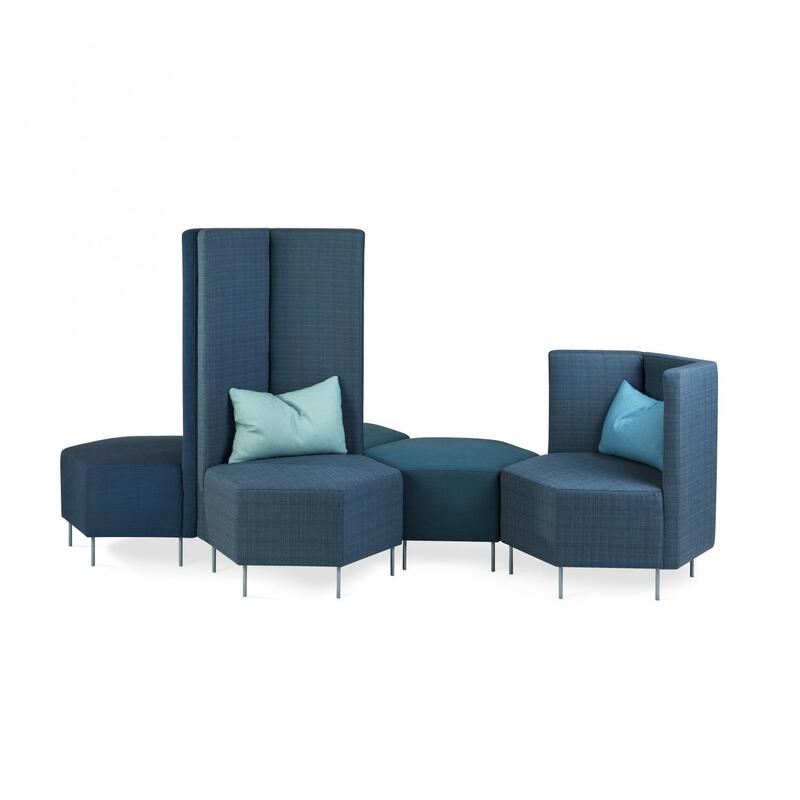 Each piece is easy to move and can be arranged into any interlocking pattern or as separate seating to suit any work style or collaborative need. Bend is a system of soft seating and tables that comes in irregular or symmetrical shapes supporting a multitude of configurations. 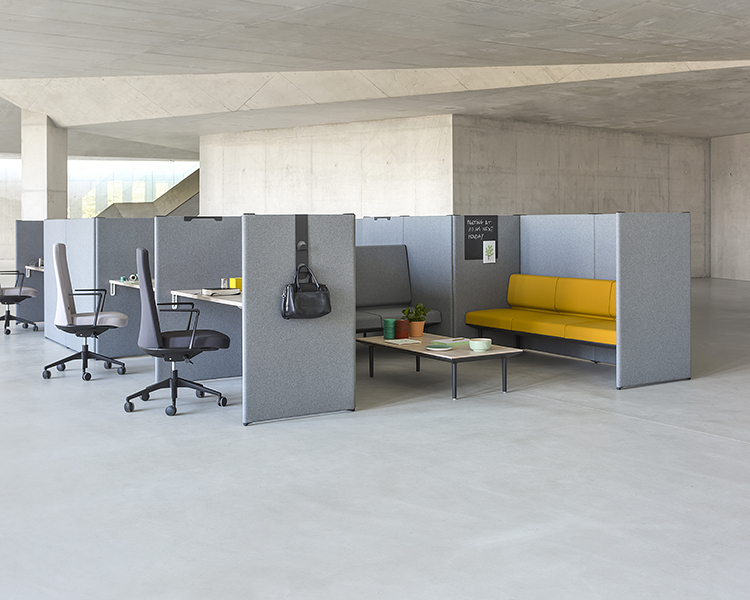 Comprised of compact modules that can accommodate multiple users in a small amount of space, Bend can transform and adapt to suit all work situations. Most modules can come with or without a backrest. Honey is a flexible seating solution that is comprised of a core of hexagonalshaped stools. Their versatile shape and construction allows Honey stools to be linked together to form an endless range of seating arrangements. Optional acoustic back panels are available to create spaces for privacy. be used in dynamic, changing offices. Casino Pedestals feature a tidy wire system, smart desktop segmentation and can be easily moved to any part of an office. Casino Caddies provide a larger storage solution, with side panels that can accommodate branding. Both Pedestals and Caddies have a cushioned top installed to facilitate impromptu meetings. Trama 8029 and I.AM Turn30 table systems provide flexible table space suitable for hot-desking, break out areas and spaces for group collaboration. making it an ideal choice for offices in constant flux. I.AM Turn tables include table linking mechanisms as a standard feature.